Over the last few months, I have paid particular attention here to artists in France and the Nordic countries who, in the late nineteenth century, painted in realist style and may be thought of as Naturalists. Their leading light was the French artist Jules Bastien-Lepage, whose works came to dominate the Salons in Paris prior to his untimely death in 1884. At the time, the work of the Naturalists received much more attention, and more positive reviews, from the critics than that of the Impressionists, and it was only during the twentieth century that we came to view the Impressionists as somehow more dominant or important than the Naturalists. Indeed, at the time, Impressionism was considered by many to be a form of Naturalism. Rediscovering Naturalism now is a difficult process: most of the great Naturalist artists have been almost forgotten, their work relegated to provincial collections and storerooms. But one of the most remarkable observations about the Naturalists is how so many were taught in just one atelier at the École des Beaux-Arts in Paris: that run by Alexandre Cabanel (1823–1889). In contrast, the Impressionists were in the main a reaction against this academic art which originated in, and was perpetuated by, the academy system and its leading school. In this article, I look at Cabanel’s own story and some of his paintings, and in the next those of some of his more Naturalist pupils. In going back to the roots of Naturalism, I hope we may understand it better. Cabanel was born in Montpellier, a city just inland from the Mediterranean coast of France, to the west of Marseille, in 1823. He moved to Paris to study at the École des Beaux-Arts when he was just seventeen, and was taught there by François-Édouard Picot (1786-1868), a prominent realist painter of narrative who also taught William-Adolphe Bouguereau, Émile Lévy, and Gustave Moreau. Cabanel’s career showed early signs of great promise: he first exhibited at the Salon in 1844 and came close to winning the Prix de Rome the following year. 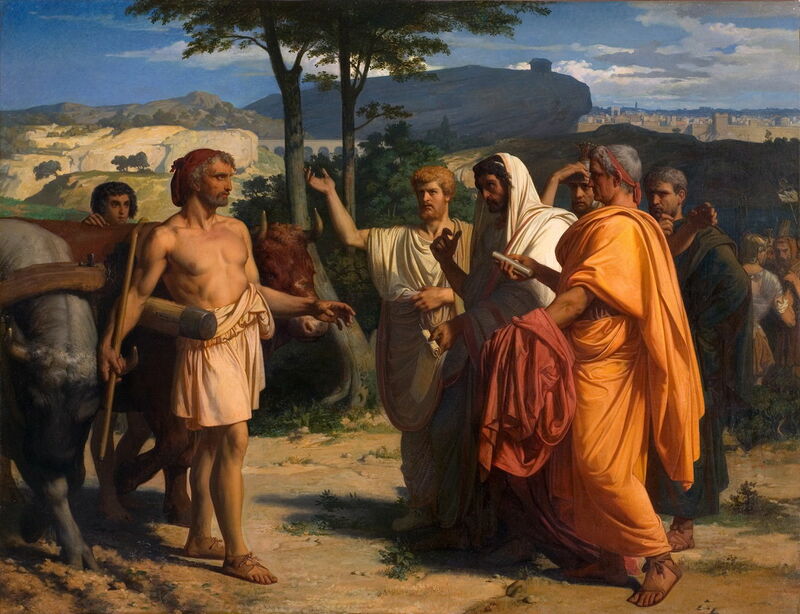 Alexandre Cabanel (1823–1889), Cincinnatus Receiving the Ambassadors of Rome (1843), media and dimensions not known, Musée Fabre, Montpellier, France. Wikimedia Commons. Painted while still a student, Cabanel’s Cincinnatus Receiving the Deputies of the Senate reveals his precocious skill. He shows in quite neo-Classical style what was a popular episode from Roman history. In 458 BCE, the Aequi living to the east of Rome tried to take the Roman town of Tusculum. When Rome responded, one of its two armies was quickly pinned down and besieged by the Aequi, and its second army was unable to help. The Senate panicked, and decided to appoint Cincinnatus as dictator. Deputies were sent out to tell him of his appointment, and found him ploughing on his farm outside the city of Rome. Cabanel shows the Senate’s deputies asking Cincinnatus to don his toga and return with them to take over command of Rome and its beleaguered armies. This work is claimed to date from 1843, which I think is an error: it has the same title and theme as Léon Bénouville’s winning entry in the Prix de Rome in 1845, when Cabanel had to accept second place, I think with this painting. Bénouville was another student in Picot’s atelier at the time, but didn’t go on to attain the same fame as Cabanel. Alexandre Cabanel (1823–1889), The Mocking of Christ (1845), oil on canvas, 146 x 113.5 cm, École nationale supérieure des Beaux-Arts, Paris. Wikimedia Commons. 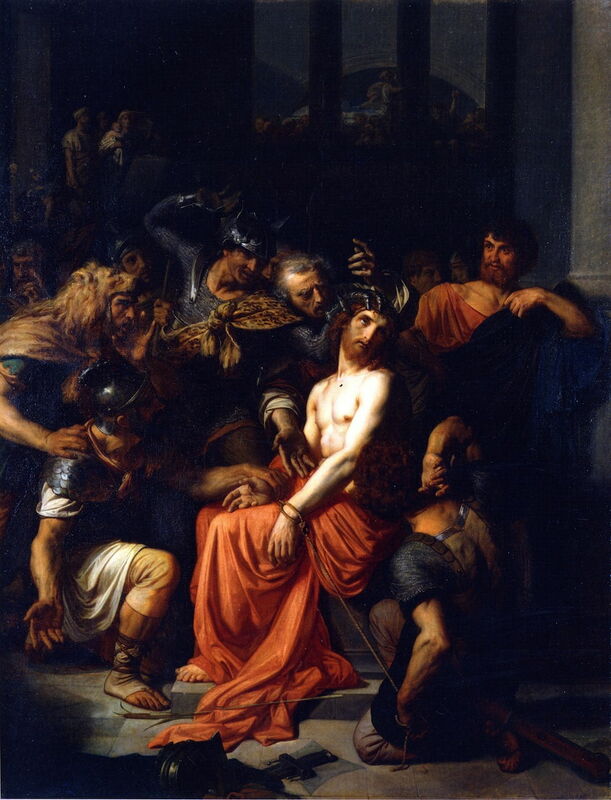 Cabanel’s slightly later painting of The Mocking of Christ (1845) is in contrastingly dark style, more akin to a religious work from the previous century. Alexandre Cabanel (1823–1889), The Death of Moses (1850), oil on canvas, 140 x 204 cm, Musée Fabre, Montpellier, France. Wikimedia Commons. The Death of Moses (1850) tackles one of the vaguer episodes in the life of this prophet of the Old Testament. When he was 120 years old, according to the book of Numbers, Moses assembled the tribes of Israel on the banks of the River Jordan, reminded them of the laws under which they must live, sang a song of praise, blessed the people, and passed his authority to Joshua. He then ascended Mount Nebo, looked over the Promised Land, and died. 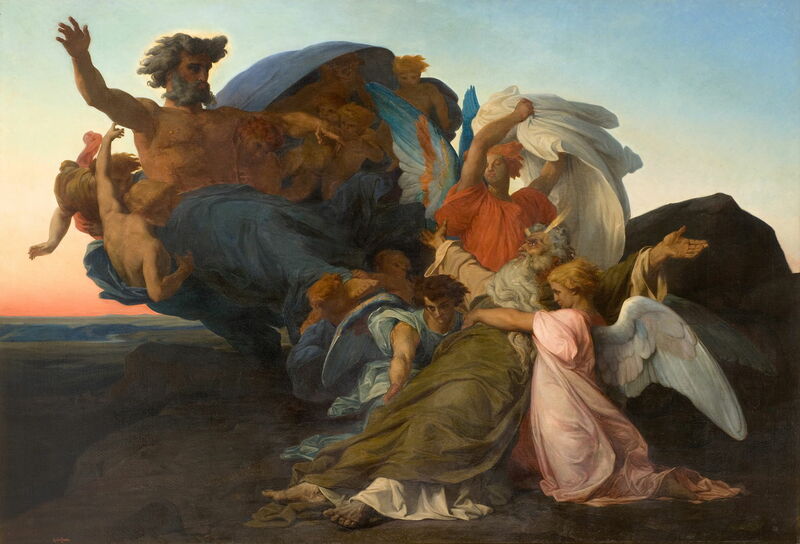 Cabanel shows this as a near-apotheosis, with God the Father (upper left) welcoming Moses (centre right) with open arms. Alexandre Cabanel (1823–1889), The Birth of Venus (1863), oil on canvas, 130 x 225 cm, Musée d’Orsay, Paris. Wikimedia Commons. It was Cabanel’s The Birth of Venus which brought him greatest success, at the Salon of 1863. An unashamedly romantic-academic depiction of this well-known myth, this painting stole the Salon of 1863 with its socially-presentable eroticism, and was bought by Napoleon III for his personal collection. In 1864, Cabanel was appointed a professor at the École des Beaux-Arts in Paris, where he taught until his death twenty-five years later. Refused by the Salon that same year was Édouard Manet’s Le déjeuner sur l’herbe (‘Luncheon on the Grass’, 1863). As the selection committee for the Salon that year had rejected more than half of the over five thousand entries, Manet was offered a place in the Salon des Refusés, which he accepted. Two years later it was Manet’s Olympia (1863) which was the talk of the Salon, but for very different reasons. 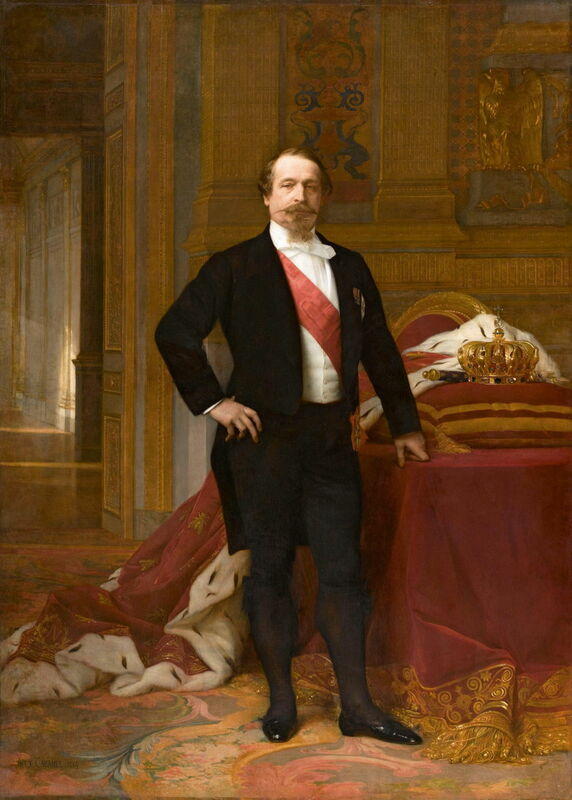 Alexandre Cabanel (1823–1889), Napoleon III (c 1865), oil on canvas, dimensions not known, Musée du Second Empire, Compiègne, France. Wikimedia Commons. Cabanel too had moved on, in an entirely different direction. His life-sized full-length portrait of the Emperor Napoleon III from about 1865 was not beyond controversy, though, as many felt that his image of their emperor should have greater grandeur. Some critics even accused Cabanel of making him look like a hotel manager or waiter! The Empress Eugenie and Napoleon’s family had no such qualms, though. Cabanel’s painting was hung in the Tuileries Palace, and when the Second Empire collapsed, and the empress fled to Britain, the painting went with her into exile. 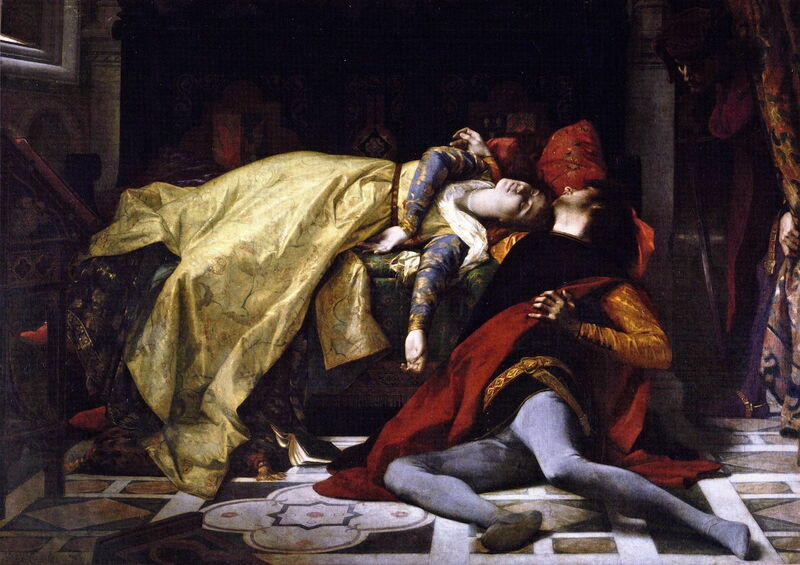 Alexandre Cabanel (1823–1889), The Deaths of Francesca da Rimini and Paolo Malatesta (1870), oil on canvas, 184 x 255 cm, Musée d’Orsay, Paris. Wikimedia Commons. Completed just before the war which brought the Second Empire to its close, The Deaths of Francesca da Rimini and Paolo Malatesta (1870) tells the story from Dante’s Divine Comedy (Inferno, Canto V) of the adulterous affair betweeen Francesca and her younger brother-in-law. After ten years, Francesca’s husband Giovanni caught them together, and killed them both. Giovanni is seen lurking in the shadows at the right. This scene had been painted by Ingres in 1819, and by Delacroix in 1825. Athough the ‘whirlwind’ motif from Inferno had generally been more popular, this became at least as prevalent in the nineteenth century. Cabanel here shows the fine detail which you might have expected to see in a depiction by Gérôme, for example. 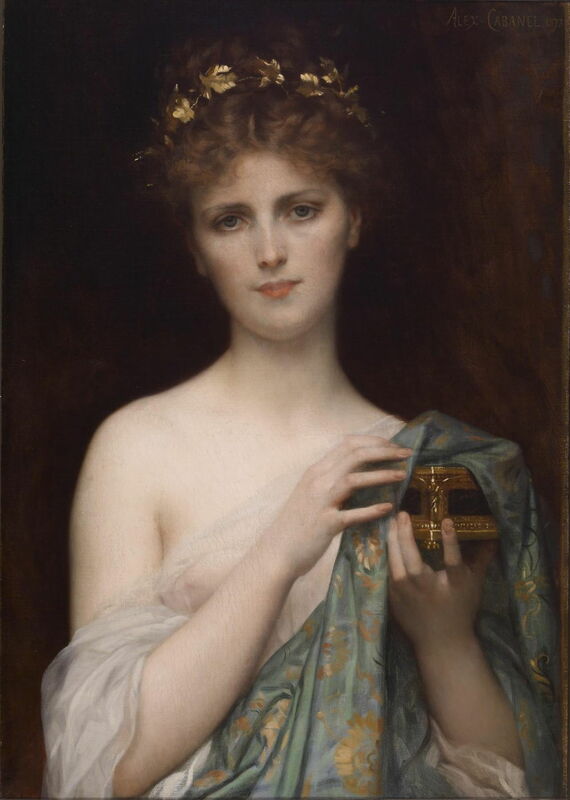 Alexandre Cabanel (1823–1889), Pandora (1873), oil on canvas, 70.2 x 49.2 cm, Walters Art Museum, Baltimore, MD. Wikimedia Commons. Cabanel’s early portraits seemed rather ordinary, but by this time he was apparently sought-after, particularly by affluent American wives, who were prepared to travel to Paris to be painted by him. This portrait of the Swedish soprano Christine Nilsson shows her as Pandora (1873), and is clearly not intended as an account of the myth. Alexandre Cabanel (1823–1889), The Daughter of Jephthah (1879), oil on canvas, 100.3 cm x 64.8 cm, Private collection. Wikimedia Commons. 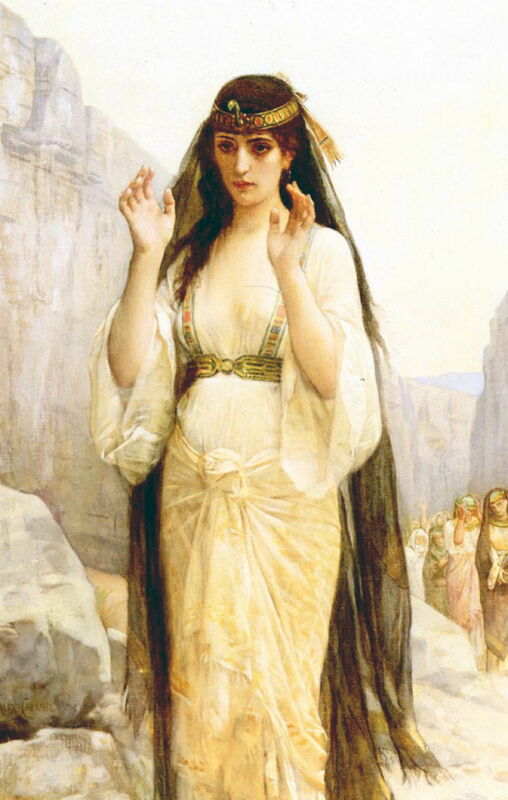 The Daughter of Jephthah (1879) is an unusual motif which he painted three years after his pupil Édouard Debat-Ponsan (shown in the next article). In this story from the Old Testament, Jephthah vowed to sacrifice to God the first object or creature which he saw on his return from victory over the Ammonites. This turned out to be his daughter. Realising her fate was inevitable, she successfully pleaded for two months’ grace, during which she went up into the mountains “to weep for her virginity”. Both Debat-Ponsan and Cabanel opted unusually to depict Jephthah’s daughter during those last months in the mountains, although their treatment and composition are quite different. Alexandre Cabanel (1823–1889), Phaedra (1880), oil on canvas, 194 x 286 cm, Musée Fabre, Montpellier, France. Wikimedia Commons. In his late career, he seems to have concentrated on the theme of the doomed woman: this next painting shows the tragic figure of Phaedra (1880), who fell helplessly in love with her step-son. When he rejected her advances, she told her husband Theseus (father of the young man) that he had raped her. Theseus cursed his son, who was then dragged to death by his horses. I have already examined this story and Cabanel’s painting in detail, and concluded that the adverse criticism made of this work at the 1880 Salon was unwarranted. 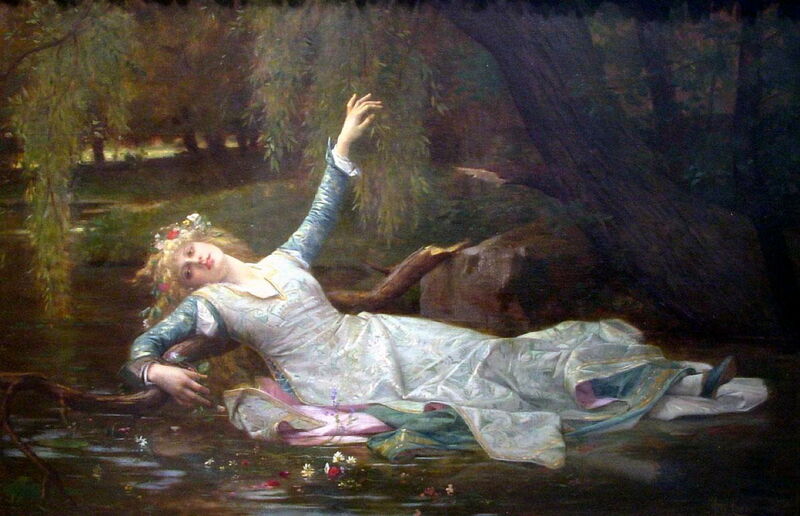 Ophelia had long been a popular character from Shakespeare’s play Hamlet to depict on canvas. Cabanel’s painting of her from 1883 shows her moments before she drowns, propped against a broken limb of a tree. This scene had been famously painted by John Everett Millais in 1851-52, a work which Cabanel would undoubtedly have seen. However, he may not have been aware that one of his most successful former pupils, Jules Bastien-Lepage, had started to paint her two years earlier, but that work remained incomplete even when Bastien-Lepage died in 1884. Alexandre Cabanel (1823–1889), Cleopatra Testing Poisons on Condemned Prisoners (1887), oil on canvas, 162.6 × 287.6 cm, Koninklijk Museum voor Schone Kunsten Antwerpen, Antwerp, Belgium. Wikimedia Commons. 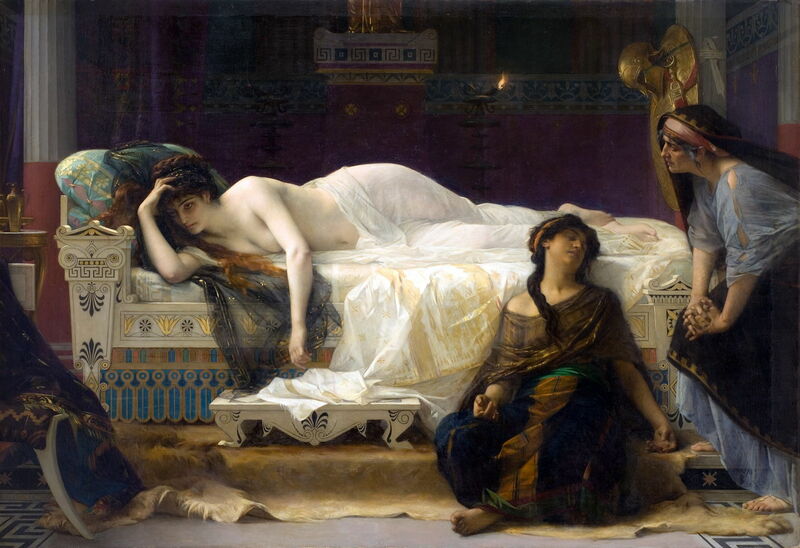 Just a couple of years before his death in 1889, Cabanel found another tragic heroine in Cleopatra Testing Poisons on Condemned Prisoners (1887). Known for her ruthless pursuit of power, and her alleged beauty, Cleopatra spent much of her life as co-ruler of Egypt with one of her brothers, including Ptolemy XIV. A few months after the assassination of Julius Caesar in Rome, in 44 BCE, Cleopatra had returned to Egypt, where she had her brother killed by poison, making her co-ruler her son by Caesar, Caesarion. 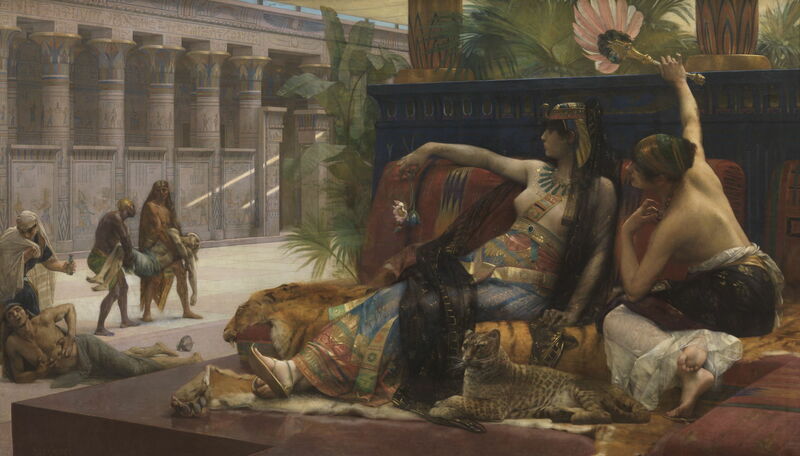 It is likely that this painting refers to an apocryphal story that Cleopatra had candidate poisons tested out on prisoners to help her select the one to be used to kill her younger brother. By this time, Cabanel’s persistent opposition to Manet and the Impressionists had failed, and his academic style had fallen from favour even at the Salon. The critics were more laudatory of his Cleopatra, though. In the next article, I will look at the work of some of his more successful students. Posted in General, Life, Painting and tagged Bastien-Lepage, Bénouville, Cabanel, Debat-Ponsan, history, Manet, Millais, naturalism, painting, Picot, realism. Bookmark the permalink.